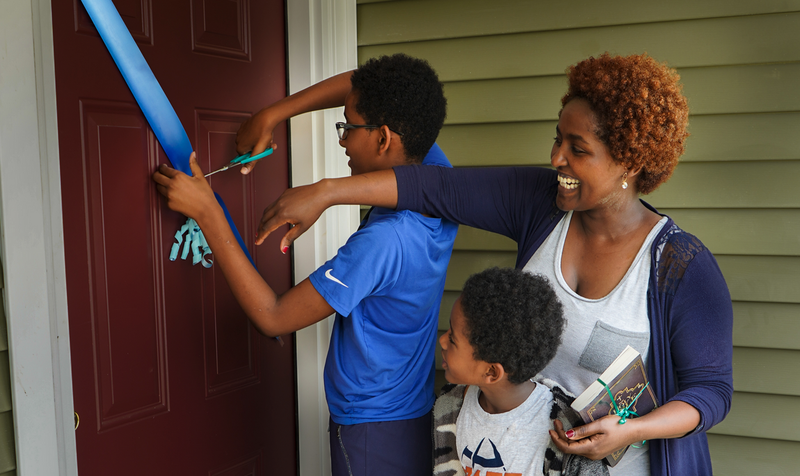 Habitat for Humanity believes that all hard-working individuals and families should have access to the benefits and stability of homeownership. In this belief, we are committed to partnering with families to build simple, decent, and affordable housing. The low cost of our homes is made possible by the exceptional support of our community. Building costs remain low thanks to impressive donations and generous volunteerism. These factors make it possible to sell our homes to accepted families with a 0% interest loan and at no profit. After determining that you meet our three criteria (need for housing, ability to pay, and willingness to partner), we ask that you attend one of our homeowner information meetings to receive an application. Applications can also be picked up in our office if you are unable to make the meeting. Once you complete and submit your application, it will be reviewed by our family selection committee. If applicable, they will request to hold a home interview and make a recommendation to our board to determine your approval into our program. If approved into the program, you will be asked to sign a covenant agreement and make a modest deposit toward your home. At this point we will work with you on a plan for earning your sweat equity hours. Once your sweat equity is complete, you will be offered a build lot, at which time you will start working on your own home’s construction! You will be considered for a Habitat home if your present housing is not adequate, and if you are unable to obtain adequate housing through other conventional means. Lack of adequate housing may include problems with the present structure; water, electrical or sewage service systems; heating system, hazardous substances, or failure to meet city property maintenance standards. You may also meet the need for housing qualification if you are living in an overcrowded or unaffordable situation. If you are living in subsidized or transitional housing, such as Section 8, you may qualify. As you will be buying your house from Habitat, you must demonstrate an ability to pay the monthly mortgage payment on your home. This monthly payment includes mortgage, real estate taxes, and insurance payments. We will help you to determine if this payment will jeopardize your ability to meet all your other family financial obligations and expenses. Your income should fall within 25% to 80% of the county’s median income for you family size (see chart). Additionally, you must have at least one year of stable income coming into your household. We can include non-work related income such as food stamps, child support, TANF, Social Security, etc. as stable income if you can guarantee you will receive that income for the next three years. All applicants will undergo a credit check. Because we are interested in your access to homeownership, we are not as strict in your credit review as a bank might be. If there has been a bankruptcy in your past, it needs to be discharged for at least a year and you must demonstrate improved credit since then. If you have a court judgment resulting in a fine or settlement that is still unpaid, the judgment must be paid off in full. You must have a reasonable level of debt, and medical bills will not be counted against you. Once you have been selected to receive a home, you become a what we call a “partner family”. This partnership is a unique characteristic of our program in that you contribute to your ongoing eligibility through sweat equity and each adult family member is responsible for completing 250 volunteer hours with our affiliate. This sweat equity hour requirement can be completed during site construction on current homes, in the our office, at the ReStore and by attending homeowner classes. Sweat equity is a fun way to stay involved with both the Habitat community and the process of completing your future home. If you meet the qualifications and would like more information about Habitat homeownership, attend our next homeowner information meeting (see next section for dates). Contact Habitat’s Poverty Elimination Coordinator by email or call 812.331.4069. We are currently not accepting applications but are hoping to in closer to summer. Please check back in June. Meetings last one hour. Please call 331-4069 to find out if dates, times or location have changed. Please come on time. Please complete the form below to submit your warranty request. There is a one-year warranty on all work done on your home by Habitat for Humanity. This warranty excludes damage resulting from wear and tear. There is also a one-year warranty on all subcontracted work such as plumbing, electrical, and heating and cooling. If a problem arises within the one-year warranty period involving work done by Habitat, the homeowner must submit a Warranty Request Form to the Habitat Director of Construction. The grievance must be addressed by the Director of Construction within seven days and will be followed by a written agreement detailing the solution and date by which the problem will be fixed. If the Director of Construction does not address a grievance within the allotted amount of time, the homeowner should contact the Family Services Director. The Family Services Director will review the actions taken by the Construction Supervisor and a response will be issued to the homeowner. Remember that in order for the problem to be properly addressed, you must submit the Warranty Request Form. If there is a problem with subcontracted work, the subcontractor is to be contacted directly by the homeowner. A home is just the beginning. While our mission at Habitat for Humanity is to end poverty housing in Monroe County through affordable housing, we also recognize that educational opportunities are inextricably linked to the same battle. It is our hope that with the stability of a Habitat home, homeowners and their children will find themselves reaching goals that they had previously never thought possible. As our homeowners strive to fulfill their personal goals, we are proud to offer a yearly scholarship to assist in their education. The Hart & Home Scholarship is named in honor of Habitat volunteer Jennifer Hart, who demonstrates an exemplary spirit and commitment to a better Monroe County. Jennifer’s dedication has inspired a yearly gift of $2,500 to fund a college-bound or enrolled student from a Habitat home. Please download and complete the scholarship application for complete eligibility and application requirements. All eligible candidates are encouraged to apply. Congratulations to the 2019 winners of the Hart and Home Scholarship! For more information email our Poverty Elimination Director, Rebecca. How long will it take for me to get a home? The whole process from application to move-in really depends on each situation but on average *may* take about 18 months. There are many factors involved with getting your home that are unique to each individual situation including available land, sweat equity hours and willingness to partner. We are committed to getting you in your home as quickly as possible. Habitat’s home ownership program is unique in two ways: (1) We sell houses to our partner families at the cost of materials plus real estate without adding in profit; 2) We offer mortgages to buy the house without charging interest. The zero-interest mortgage is significant because a loan from a commercial bank adds interest payments, which can more than doubles the “cost” of the home to the buyer. Our policy is that families should repay their mortgages as fast as they are able and our average mortgage is 15 years. However, mortgages may be extended to 20 or even 25 years in order to keep payments affordable. There is no penalty to the buyer for paying off the mortgage ahead of schedule – though other restrictions may remain in place for the entire original mortgage period. Will I get to choose where I live? Our home lots are offered to families as they become available. We have built homes in all parts of Bloomington, so there is no guarantee where your lot will be. You have the option of refusing the first lot offered to you, but you will be asked to reapply to the program if you turn down a second lot offer. Who pays to build each house? We work with faith communities, businesses, and other organizations and individuals to sponsor the building of a house. Such sponsors contribute a fee that goes towards buying materials for the home and typically sponsoring organizations also volunteer skilled and unskilled workers to build alongside the homeowners on the house they sponsor. Once an affiliate has built 20 houses, the monthly mortgage payments from those 20 families are sufficient to build an additional house each year. Thus, as mortgage payments are recycled, homeowners also sponsor Habitat houses. Other funding comes from grants and individual donations. How will I earn sweat equity hours? The primary way to earn sweat equity hours is by working on the construction site (at least half of your hours must be completed this way) and additional hours may be earned by working in our office, attending homeownership classes, helping at ReStore and attending special events. New ideas to earn sweat equity are always welcome but must be approved ahead of time by the poverty elimination coordinator. At a minimum, each adult member must complete four hours a month. A friend may donate up to 50 hours towards a family’s sweat equity. An important part of preparing partner families for the responsibilities and potential pitfalls of homeownership are the classes that we provide. There are at least three series of classes on the topics of Habitat Philosophy and Partnership, Financial Planning, and Home Maintenance and Neighborhood Development. Partner families are expected to attend these classes (counted towards sweat equity hours). How big will my house be? House size depends on the number of family members who will be living there. The following is the maximum square footage for each house size: 900 square feet for a two-bedroom house, 1070 square feet for a three bedroom house, 1230 square feet for a four-bedroom house, and 1400 square feet for a five-bedroom house. The square foot numbers describe living space not including stairwells, crawl space and exterior storage. What does the floor plan look like? The size and floor-plan for each home we build is determined by the number of family members. Habitat provides a standard floor plan for each size house, which might need to be adapted to meet special needs of the lot or particular considerations of the family. All adjustments to floor plans are minimal and there is no guarantee that we can meet all the desires of the family. Am I able to customize my home? Vinyl siding and exterior door colors. If possible, some minimal changes to the basic floor plan. Can I pay for additional customization? 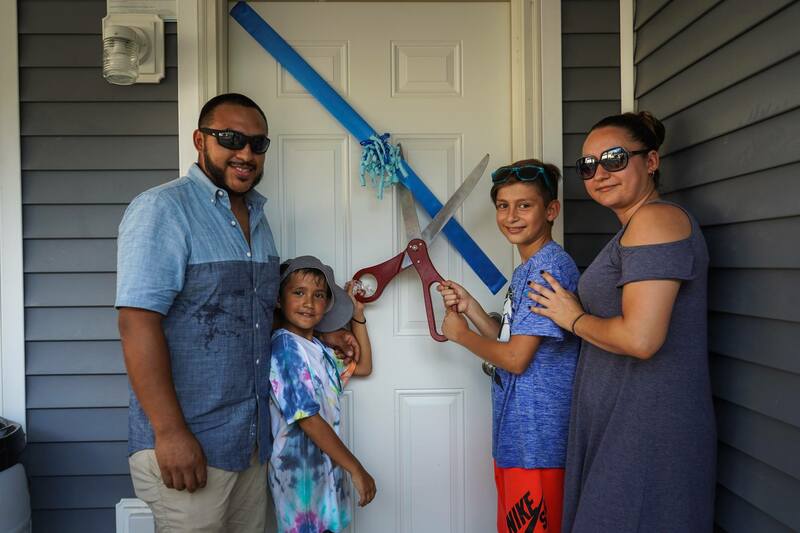 In an effort to personalize and beautify the home while still staying true to Habitat’s mission of building simple, decent, affordable housing a family may choose to add custom options in combination up to $2000, which will be added to their mortgage. Examples of these options include: appliances, ceiling fans, landscaping, extra windows, air conditioning, etc. Are Habitat home built 'green'? In a further effort to ensure affordable housing, we have focused on building energy efficient homes. All of our homes are up to Energy-Star standards, and we are making steady progress towards even higher levels of green certification. This commitment helps not only the environment, but it also helps create sustained energy savings for our partner families. You may contact the office for a comprehensive list of house features. Does my house come with any warranty? There is a one-year warranty on all work done by Habitat. This warranty excludes damage resulting from wear and tear. There is also a one-year warranty on all subcontracted work such as plumbing, electrical, and heating and cooling. What if I need or want to sell my house? We want to build homes for people to live in, not to sell and make a profit. We do have guidelines for selling your home that will be discussed during homeowner meetings.